August the 2nd 2013 and I woke (slightly gingerly it must be said) to the above photo on Facebook. 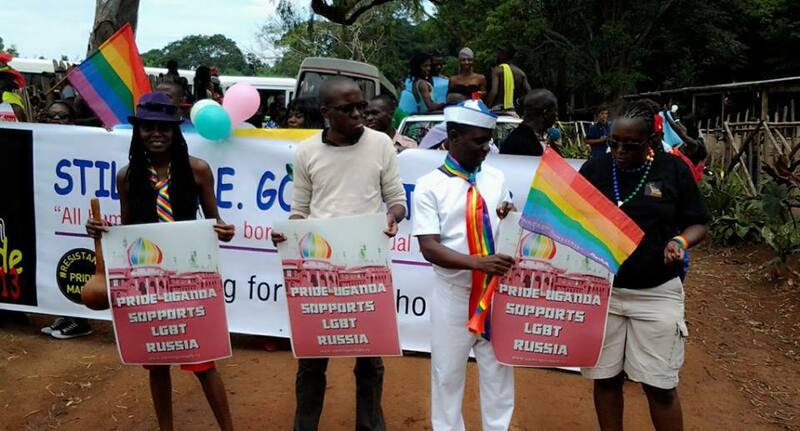 Uganda Pride supporting LGBT Russia. Aside by my personal chuffness that an idea Karol and I cooked up and Brighton & Hove Pride made a reality had made it to shores so far way, I was amazed by the compassion of the brave Ugandan LGBT community. Attending Pride in Uganda is a dangerous business. And as from Friday the 20th just being gay in Uganda has become life threatening. Repeat offend the charge of aggravated homosexuality and that’s that. Life imprisonment. Banged up and worse still for being who you are, for loving as you want, for being queer. Today I was queer. I wrapped Xmas gifts for my queer missus. I co-habit with her. I wrote incriminating text messages as I wished her well in the supermarket storm. I made reference to something gay on social media. (Knowing me I probably did it too many times to count – and all before lunch). I indulged in a Babs Christmas Album singalong. (Apologies neighbours). I think I may have even minced to the kitchen to make a brew. Yep I’ve been queer all day long. And that’s before the missus returns from work and the holiday Baileys are cracked open. A definite case of aggravated homosexuality. Which, quite frankly, is bloody ridiculous. And all worthy of landing me in jail. Which is why we must stand tall for those who can’t. Proud in the face of draconian laws that the world must find a way to stop. We need to protest and petition. We need to keep our Pride celebrations and parades political. We must ensure that heartbreaking social media posts from Ugandans terrified that their own parents will report them to the authorities because of their sexuality don’t go unheard. And we must find a way to stop just thinking local and start to think global. Who cares about the minutiae of Pride celebrations, park action or disco politics. We’re alright Jack. It’s time to look beyond our bubble, however hard our own local struggle. Uganda. We can not remain silent because there but for the grace of location go I. And you. And we. For further insights check out Patience Akumu‘s latest blog.